Have you ever noticed the cracking of tiles or hear a hollow sound when walking on a tiled floor? The reason: Cement and sand mixture used for fixing tiles doesn’t form a level base to cover the entire tile surface. Moreover, cement shrinks over a period of time, leading to hollow spaces under the tile. This is what causes the cracking of tiles or the hollow sounding tiles. Here is the perfect solution for it! 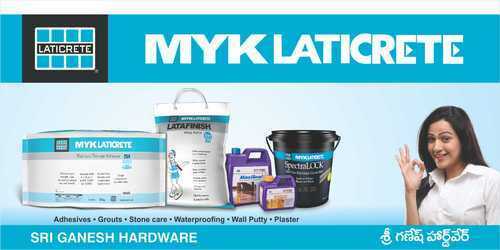 USE MYK LATICRETE THIN-SET ADHESIVES FOR PROBLEM-FREE FIXING OF TILE & STONE. MYK LATICRETE Tile Adhesive is a factory made cementitious dry powder which is mixed with water or special liquid additive to form a paste. This paste is applied on the floor concrete and the tile is pressed on it to complete installation. MYK LATICRETE Tile Adhesives provide: Full bedding (cover entire surface) to the tile/stone Strong and problem-free installation when compared to the conventional method. MYK LATICRETE thin-set adhesives which have high bonding strength can be used for renovations without the hassle of breaking the existing tiles on the floor or wall. Tile or stone can be directly fixed with MYK LATICRETE thin-set adhesives without fear of de-bonding. MYK LATICRETE thin-set adhesives are manufactured under stringent quality control procedures to ensure world-class products that have been globally proven and professionally endorsed for years. Areas of usage: Residential and commercial floors and walls Swimming pools External cladding This superiority of MYK LATICRETE Tile Adhesives is what has made them the first choice of those who demand the best. Offering you the complete assurance of a sound, crack-free and durable tile surface.